Today I saw three more kittys. Mint-leaf, a gray taby I saw was the first kitty I saw. Next, I saw an orange taby I named Tiger. 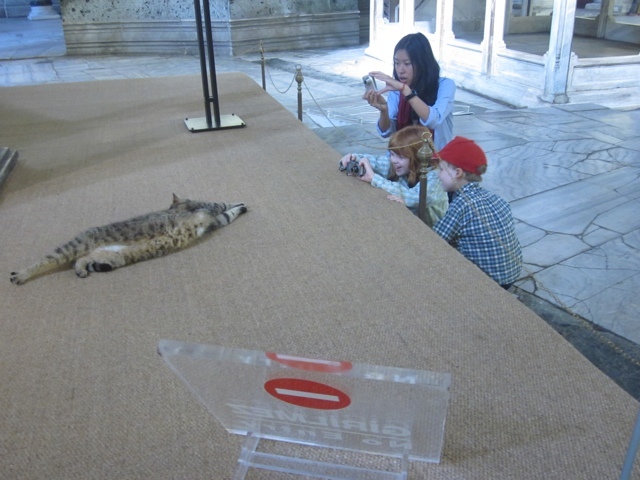 Last I saw Egite [pronounced eh-gypt], another gray taby that was in Hagia Sofia. Guess what? The only thing in the whole big place I liked, loved, appreciated & focused on was Egite. There are so many kinds of [porcelain] blue kittys I can’t pick out which one to take home!